Heineken has taken green branding to a whole new level at its US corporate headquarters in White Plains, NY. Working with sustainability consultants CodeGreen, MKDA Architects helped renovate the interior of the beer giant's 360 Hamilton Place office, adding new glass walls, flexible work stations, low VOC-emitting finishes and energy and water-efficient appliances. For its gains in conservation and efficiency and overall workspace enhancement, the newly sustainable space was recently awarded LEED-CI Gold by the USGBC. MKDA took a flexible approach to Heineken‘s newly-renovated corporate headquarters in order to create a better sense of community. 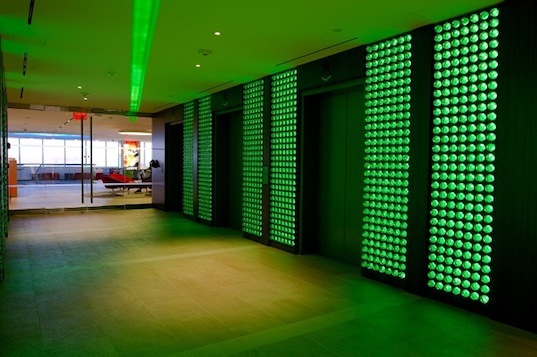 We especially like the lobby walls inlaid with Heineken bottles, don’t you? In addition to an influx of natural lighting and energy-star appliances that drastically reduce the company’s electrical load, a lot of the materials used were comprised of both pre- and post-consumer recycled content. 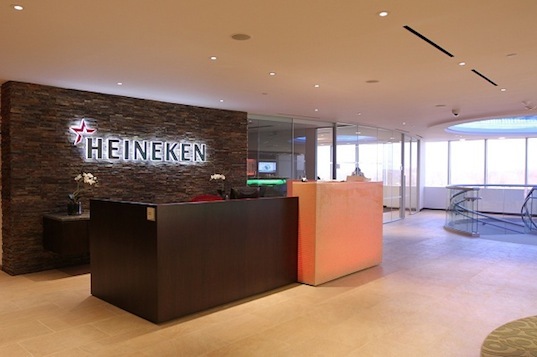 Combined with the LEED-EB Gold certification previously awarded to their 12-story, 384,000 square foot tower, Heineken is definitely turning into a lean, green machine! MKDA took a flexible approach to Heineken's newly-renovated corporate headquarters in order to create a better sense of community. We especially like the lobby walls inlaid with Heineken bottles, don't you? In addition to an influx of natural lighting and energy-star appliances that drastically reduce the company's electrical load, a lot of the materials used were comprised of both pre- and post-consumer recycled content.